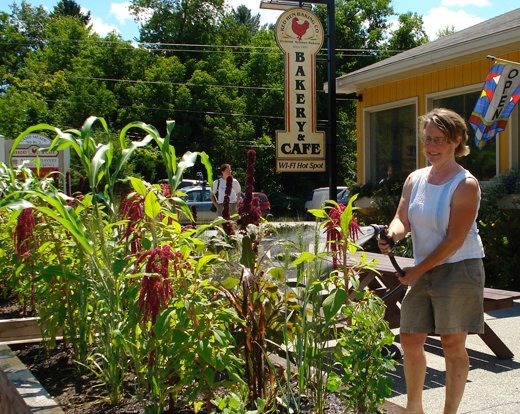 VERMONT -- Driving by the Red Hen Baking Co. along rural Route 2 in Middlesex, one might notice something unusual towering above the cars filling the parking lot - nine-foot tall broom corn (Sorghum spp) growing alongside amaranth, quinoa, millet, wheat, oats, sunflowers and barley. Toss in a little parsley and basil and one has the ingredients necessary for a wonderful loaf of freshly baked herb bread. Showcasing these grains, carefully and organically grown in handmade hemlock raised beds adjacent to the popular eatery, is the brainchild of Sarah Holland of Moretown, one of the NOFA Organic Land Care Program's original accredited professionals and one of just a handful of AOLCPs in the state of Vermont. 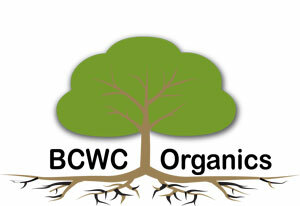 An 8 hour intensive workshop focusing on how organic land care practitioners - and those transitioning their business - can take their business to the next level. Our annual event discussing hot topics in organic land care, with vendors and exhibitors, and a social environment where folks can discuss the past business season while meeting old friends and new. Call our office to discuss exhibiting and sponsorship opportunities for our premier event! NOFA Organic Land Care Program's flagship program - its 30 hour course focusing on soil health, compost, stormwater management, pest management, planting and more! Day 4 now offers the choice of two tracks - turf or organic landscaping. You can take the exam, pay an annual fee and start marketing yourself and your business as a NOFA Accredited Organic Land Care Professional or an AOLCP! March 8, 2014 - Save the Date! Member Benefit Program - AOLCPs - receive discounts when shopping with participating businesses. Businesses- reach new customers by offering discounts! New businesses will be added monthly. Click here to see the full list of participating businesses. Join the Butterflies tomorrow, August 16 for the unveiling of a new butterfly house in Great Barrington, MA! Great Barrington - Promoting the connection between native habitats and local wildlife, Project Native has opened a Native Butterfly House open to the public at its native plant nursery on North Plain Road. An open house to unveil the new facility will be held Friday, August 16, from 5 to 6:30 p.m.
"People see a beautiful butterfly but they don't connect it to their landscape," Project Native Education Director Karen LeBlanc said. "With the butterfly house they will understand that caterpillars need certain plants to live and eat. If you don't have the plants, you're not going to get the butterfly." The Emerald Ash Borer (EAB) has been found in another CT town! So far the CT Agricultural Experiment Station has reported the EAB in Prospect, Naugatuck, Bethany, Beacon Falls, Waterbury, Cheshire, Oxford, Middlebury, and now, Hamden. Surveys for this invasive insect were done with the help of UConn Cooperative Extension and CT DEEP. EAB only attacks ash trees, especially stressed specimens. Because this insect feeds on the phloem and cambium of the tree and also tends to feed in groups rather than individually, infected trees usually die. For more information on this insidious insect, click here. Armillaria root rot caused by the fungus Armillaria mellea and other closely related species can occur on many woody and some herbaceous hosts in the northeast. Symptoms of dieback or decline may start to appear within one year after infection. Most often, infection occurs when roots of a plant reach the fungus where it is already established in a decaying stump or other organic matter. A. mellea is capable of growing through the soil for a distance of several feet per year in the form of rhizomorphs, black root-like structures that give the fungus one of its common names 'shoestring fungus'. Signs to look for in declining trees or shrubs include white mycelium growing between the bark and wood at the base of the stem or trunk, the presence of rhizomorphs in the soil or between loose bark and wood, and small to large clusters of tan mushrooms in the fall at the base of the trunk near the soil line. This disease is most common on host plants stressed by other factors and on sites that were previously forested. Date/Time: Tuesday, September 10, 2013 - 8:30 a.m.-5:00 p.m. 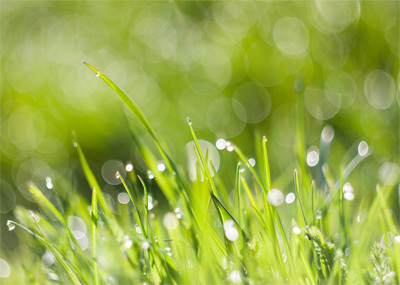 This month, we'll focus on Water Use and Water Quality. Unprecedented fresh water shortages, declining stream levels, and degraded water quality are serious and growing problems in the United States, as they are in much of the world. 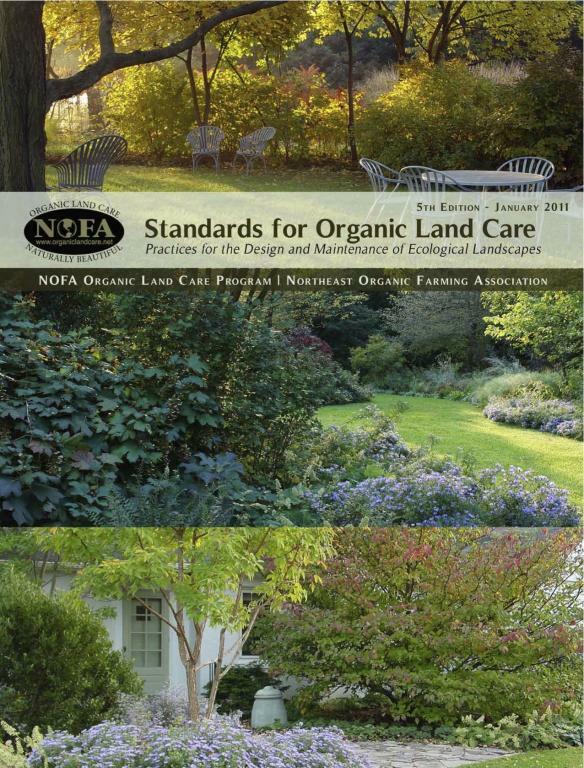 The following excerpt on preferred organic lawn maintenance practices can be found on page 12 of the NOFA Standards for Organic Land Care. Use of broken or leaking irrigation systems. Broken systems include improperly wired or installed systems and improperly scheduled irrigation runs (e.g., irrigation during rain, for excessive run times, etc.). 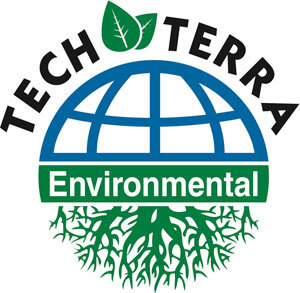 Synthetic turf, plants, or mulches. Synthetic materials, such as recycled tires, may contain lead, cadmium, and other hazardous compounds that can contaminate surface or groundwater.